Place of Origin: South and Central America. Typical Tank setup: Although the Yellow Acara will appreciate live plants, they are known to dig them up so strong roots and plenty of substrate is advised. Other than live plants it should be a typical South American cichlid arrangement with plenty of open swimming space as well as hiding places formed out of bogwood and rocks. 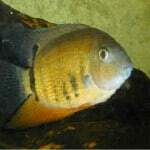 Compatibility: The Yellow Acara should be kept with similar sized South American Cichlids. 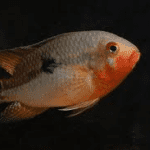 Feeding: The Yellow Acara is an omnivore and should be fed a variety of foods, such as frozen or freeze-dried brine shrimp, bloodworms, blackworms, flake food, and Cichlid pellets. Yellow Acara also relish live food and should occasionally be provided with live brine shrimp, guppies, minnows, shrimp, worms, and crickets. Sexing: The male Yellow Acara will be larger than the female, but the female will grow thicker. Breeding: Yellow Acara are substrate, egg layers that practice brood care. Yellow Acara are difficult to breed, but to help induce breeding and sustain the ideal breeding environment, the water level should be lowered and then replaced while the temperature is raised to and maintained at about 86° F. The female Yellow Acara will lay from 150-250 eggs in a carefully cleaned and selected location (smooth stones, slate, flat rock, etc). The eggs will hatch in 2-3 days and the fry should be swimming around within a week. The newly hatched fry can be fed a diet of baby brine shrimp and then moved to other foods as they mature. Additional Information: Although they are generally considered to be a peaceful species and have been successfully kept in Community aquariums, the Yellow Acara is can show aggression; even more so during breeding. Yellow Acara will bully small fish and eat the tiny ones, therefore, tank mates should be considered carefully and should be comparable in size.